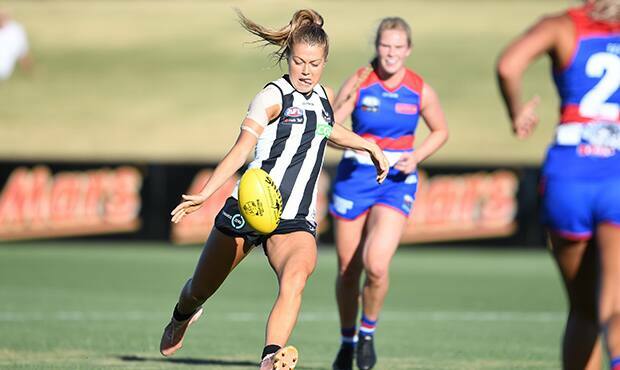 Collingwood AFLW coach Wayne Siekman has taken plenty of positives from his team’s seven-point loss to the Western Bulldogs in Saturday’s practice match at Mars Stadium in Ballarat. The Pies trailed the reigning premiers by just one point with two and a half minutes remaining, before a late goal to the Dogs saw them emerge victorious 5.5 (35) to 4.4 (28). “It was a good day, a really good day, and a great hit-out,” Siekman told collingwoodfc.com.au. “To play the reigning premiers from last year in a practice game is great because we want to test ourselves against the best. “Certainly, as the game went on we got better. I reckon if we could take that first quarter back we would. “In that first quarter we didn’t quite do the basics well enough, and then at quarter-time we addressed that and we did the basics pretty well after that. Among Collingwood’s best players was star Irish recruit Sarah Rowe, who kicked two goals, including the major that brought the Pies within a point midway through the last quarter. Rowe was involved in one passage of play that made her coach chuckle. One of her teammates had a shot at goal and the ball hit the post and bounced back into play. Assuming she could grab the ball and play on, like in Gaelic football, Rowe took possession and kicked it through the goals, only to discover that play stops as soon as the ball hits the post in our code. “There are so many rules in a game of footy, so you can’t tell her everything,” Siekman said with a chuckle. Draftees Jordyn Allen and Katie Lynch also showed plenty of promise. Allen played down back, drawing praise from Siekman for courageously going back with the flight of the ball into a contest in the last quarter. “No fear from a first year player, so that’s really exciting to see for our fans,” Siekman said. Lynch came on in the second half and showed her power and skill while playing as a key forward. “She set up a couple of goals for us, so there were plenty of positives from the new players,” Siekman said. Former elite netballer Sharni Layton made her footballing debut and gave her all while playing up forward and in the ruck. “Like Sarah Rowe, they’re going to get better every game they play,” Siekman said. “For Sharni, we know she’s a competitor. She hates to get beaten. So it doesn’t matter where we player her, because she’ll just compete.